Armenia is scheduled to host the 15th edition of ‘Hay Fest’ International Performing Arts Festival on 1-8 October. 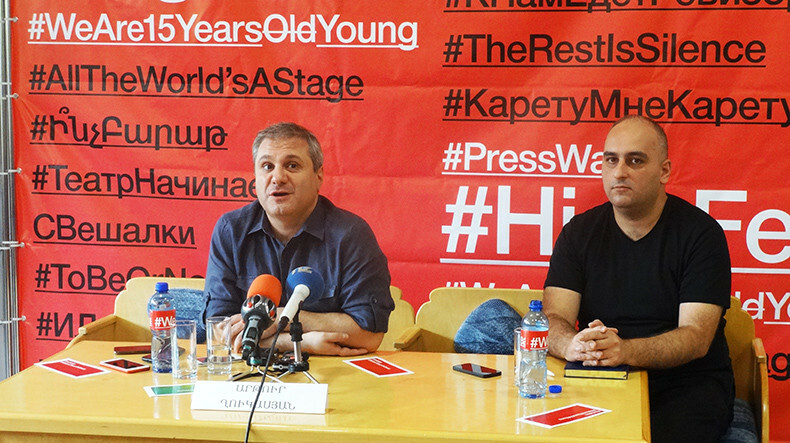 This year, the festival titled ‘We are 15 years old young’ will host some 250 participants and guests from 20 countries, the festival director Artur Ghukasyan told a news conference on Friday. Mr. Ghukasyan detailed that among the guests are prominent art experts, art managers, presidents of international theatre festivals from the UK, U.S., Brazil, Italy, Bulgaria, Sweden, Poland, Israel, Germany, Greece, Kazakhstan, Russia, Iran, Georgia and other states. More than 50 performances will be played on 12 venues in capital city Yerevan. The director added that the theatre lovers will have an the opportunity to watch productions in the genres of drama, music, dance, mono performances, mime, movement, circus, street performances, puppet/marionette, etc. The guests of the festival will deliver master classes. The ‘Hay Fest’ International Performing Arts Festival will be opened with the “Yakish and Pupche" performance by Sukhumi Dramatic Theatre of Georgia at Stanislavski Russian Theatre of Yerevan. Artur Ghukasyan also informed that on 6-8 October Yerevan will host Caravan Tbilisi & Yerevan 2017 meeting of IETM (Informal European Theatre Meeting), which aims at contributing to the contemporary Armenian performing arts, as well as finding out partners for further cooperation. The entrance is free for foreign performances.